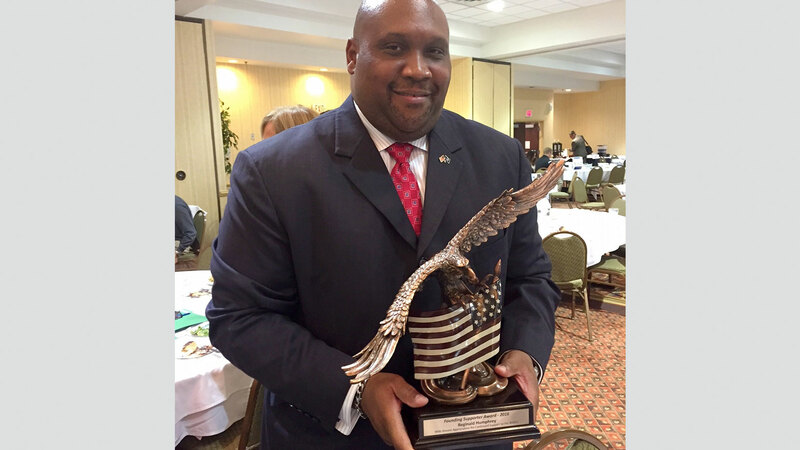 Reggie Humphrey, Senior Manager, Supplier Diversity General Motors Global Supply Chain, accepts the NVBDC’s Founders Award. The 11th Annual Veteran Business Meet and Greet Event on November 10th was a huge success with over 30 Corporations in attendance to meet with 245 SD/VOBs in attendance. "This was the opportunity of a lifetime for our SD/VOBs," said Matt Sherwood, Executive Director, VetBizCentral. "Amazing things happen when you connect veteran business owners with the country's senior corporate decision-makers in an informal setting." Attendees included new corporations such as BMW and FCA, as well as many of the NVBDC sponsors from previous years. SD/VOBs also came from states across the country. In 2017 the NVBDC will assume management of the event, further delivering on its mandate to facilitate access for SD/VOBs to organizations that want to purchase their products and services. A luncheon was held with Keynote remarks by Reggie Humphrey, Senior Manager, Supplier Diversity - General Motors Global Supply Chain. Afterwards Keith King presented the NVBDC’s Founders Award to Mr. Humphrey “to recognize and thank an outstanding individual and the company he represents that has been critical to our successful launch and early accomplishments and who continues to be very instrumental in our growth and future success”. "The feedback has been tremendous from both the SD/VOBs and the corporate attendees across the nation," said Keith King, President of the NVBDC, "we had SD/VOBs from Arizona, New York, New Jersey and Georgia and we expect to hear good news about new contracts and awards in the near future." The event featured round robin introductions between leading corporations and SD/VOBs. Organized by VetBizCentral in conjunction with the National Veteran Business Development Council (NVBDC), the conference has been a go-to opportunity for SD/VOBs to meet and network with leading companies for the past eleven years. The National Veteran Business Development Council is a nonprofit 501C3 organization dedicated to certifying Service Disabled and Veteran-Owned businesses of ALL sizes. The NVBDC assists the advancement and growth of veterans who pursue the dream of owning and operating a business. Please visit us at: www.nvbdc.org or on Facebook at facebook.com/nvbdc.